In “Smokey Mountain,” Lewis Suzuki depicted an impoverished community in Manila. 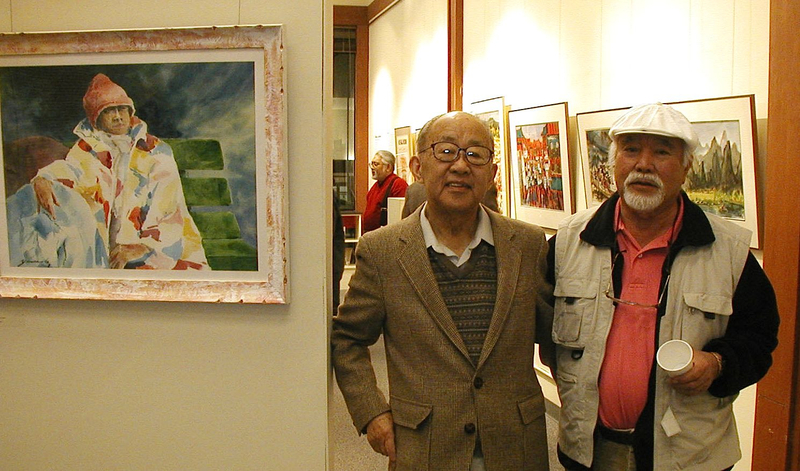 BERKELEY — Noted artist and peace activist Iwao Lewis Suzuki passed away on Jan. 24 at the age of 95. Suzuki’s father initially entered San Francisco in 1912 by jumping ship, after which he made his way to Los Angeles and supported himself as a musician. Eventually returning to Japan and marrying, he and his wife moved to Los Angeles, where he opened a dry-cleaning business, and where Lewis was born on Nov. 29, 1920. In 1929, Suzuki’s father died, and his mother returned to Japan with her six children. There, Suzuki excelled in the art programs in his primary school, attended Kawabata Art Academy in Tokyo, and began exploring the possibility of studying art in the U.S. In 1939, a fellow passenger on a commuter train saw him looking at a catalog of American art schools, and upon learning that Suzuki had been born in the U.S., strongly suggested that he leave Japan immediately. Suzuki later recalled that the man showed him photos of the atrocities committed by the Japanese in Nanking, and warned that if Suzuki stayed in Japan he would be forced to join the military and participate in such acts. He gave Suzuki the name of a man to contact in Los Angeles, which Suzuki did when he returned to California later that year. The man, Edo Mita, helped him get settled in Los Angeles, where Suzuki completed high school, took classes at Otis Art Institute, and worked as a houseboy. Edo invited Suzuki to Marxist study groups at his house frequented by Japanese members of the film industry who discussed their concerns of Japan’s growing militarism. In 1941, Suzuki moved to Washington, D.C., where he worked at the Japanese Embassy primarily as a “tea boy” and took classes at Corcoran School of Art. 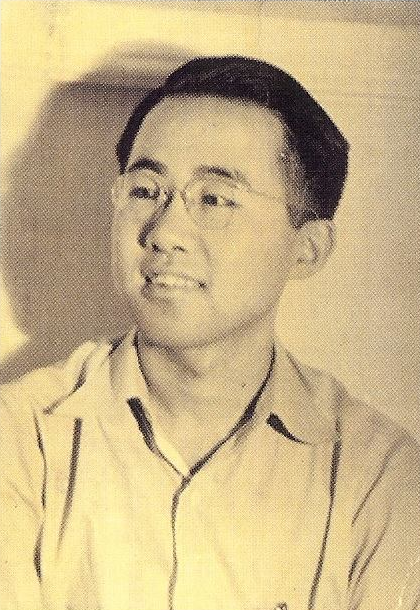 After the bombing of Pearl Harbor, all embassy officials were to return to Japan, but Suzuki wished to remain in the U.S. He joined the U.S. Army and taught Japanese at the Military Intelligence Service Language School in Minnesota. After the war, he moved to New York, where he studied at the Art Students League and earned a living as a cabinet-maker. Suzuki became politically active in issues of peace and justice, and believed in the role of art in furthering these causes. He traveled to Hiroshima, which had been devastated by an atomic bomb, and would later create a graphic work, “No More Hiroshimas,” and other peace posters for the American Friends Service Committee. In 1952, Suzuki traveled to China with the American Peace Crusade and met his future wife, Mary Bonzo, an American citizen who had grown up in the Philippines and was in China with a Quaker group. The couple married and settled in Berkeley, where Mary was attending school. Suzuki continued to work as a cabinet-maker while also painting, teaching and exhibiting. Eventually, he was able to make art full-time. Suzuki was a member of the politically active Graphic Arts Workshop from 1953 to 1963 ad was also a participant in many art fairs held throughout the state, preferring to sell his art directly to people rather than through a gallery. Shows at shopping malls and parks, he said, were a way to connect with people who may not visit a gallery or have a strong knowledge of art. Working primarily in watercolors, his works were loosely painted, brightly colored still lifes, landscapes, seascapes and city scenes. 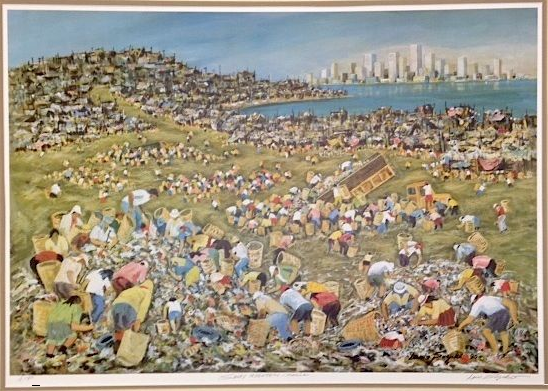 A trip to Manila in 1986 prompted him to paint “Smokey Mountain,” which depicts the dire conditions of the community that existed on the city’s landfill. Suzuki’s bold and imaginative use of color won him numerous awards, including two at the Society of Western Artists show at the De Young Museum in San Francisco. He served on the Berkeley Art Commission and was recognized by the City of Berkeley in 2010. 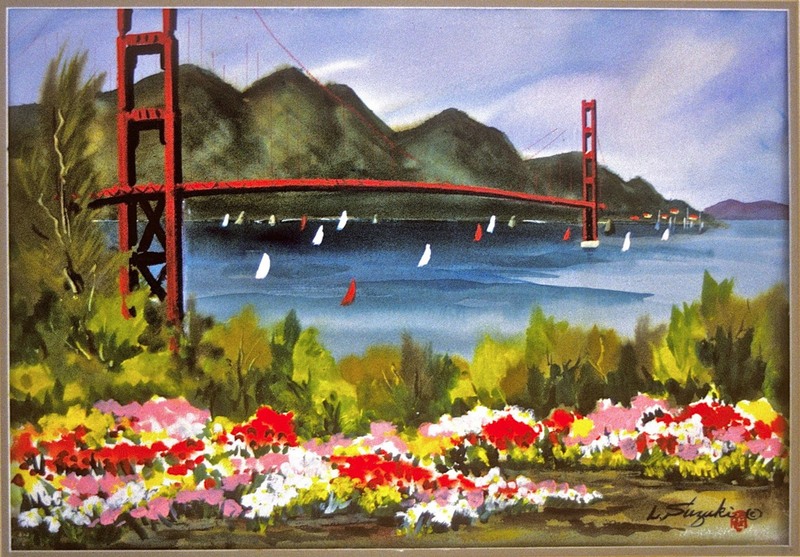 Until recently, he continued to work at his studio on Grant Street in Berkeley, participating in such events as East Bay Open Studios and Berkeley Artisans Holiday Open Studios. As a peace activist, he was a delegate to the Asian Pacific Peace Conference in Beijing and to the World Peace Conference in Vienna. 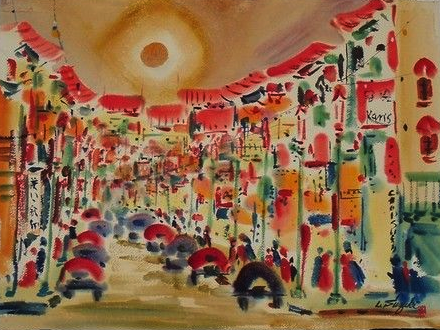 A watercolor of San Francisco Chinatown by Lewis Suzuki. A landscape by Lewis Suzuki featuring the Golden Gate Bridge. 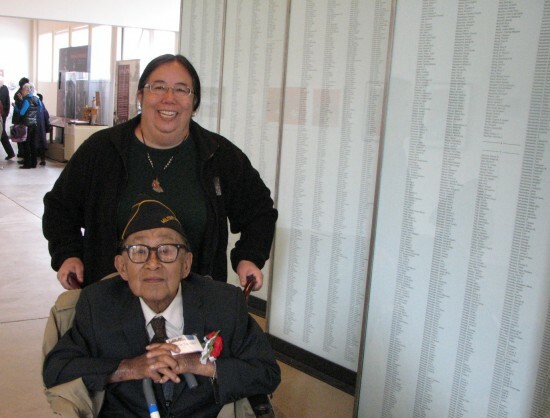 As a veteran of the MIS, he attended such events as the Congressional Gold Medal ceremony in Washington, D.C. in 2011 and the opening of the MIS Historic Learning Center at the Presidio of San Francisco in 2013. Survivors include his son Masao and his daughter Fumi. I remember his peace poster from the 60’s which was displayed in windows all over Berkely homes and apartments. I teach in a school across the street from his home and studio, and he always contributed his artwork to our annual fundraiser. An artist who brought his talent and historical understanding in profound and compelling watercolors to all audiences.